If you want to learn to pray the first thing you should do is pray. The Christian story of the world is clear: God is fully invested in knowing us and talking to us before we ever think about talking to him. The gospel shows us how far God is willing to go to have a relationship with us. Conversations with God are not, cannot, be happening because we get in the right posture or say the perfect words or perform enough deeds. Eugene Peterson, author of The Message, wrote one of the best books on prayer: Answering God. The premise of the book is that God always speaks first and we are always answering him. Peterson uses the metaphor of teaching babies to talk. Parents lean over the crib and speak incomprehensible words to an infant and this is how the infant learns to make sounds and eventually words. 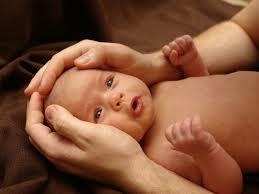 The best thing we can do in prayer is remember we are infants. Stop trying to make prayers that seem “well done.” Make sounds to God. Cry out. Ask for needs to be met. Laugh upwards in joy. Reach for Help. This entry was posted in Gospel, Prayer and tagged aswering God, Christianity, Eugene Peterson, God, gospel, infant, prayer, speech by RonKJones. Bookmark the permalink.